Mayramkul Asanaliev is a leading Kyrgyz artist and scholar of traditional hunting. You may remember Mayramkul as a participant in the workshop of Indigenous Cultural Practitioners facilitated by the Conservancy in 2013. At the recent Global Big Cat Alliance gathering in Timbavati, South Africa, Mayramkul presented his recent paintings, drawn from the ancient culture of Kyrgyzstan. He began his talk with the news that one of his traditional hunting dogs had produced a litter of puppies right before he left – a good sign for fruitful work in the gathering! You can see this beautiful dog—a sighthound breed called a Taigan in the Kyrgyz language—in Mayramkul’s painting above. Before Soviet times, totem animals such as the lion, snow leopard, and eagle were sacred and central to daily life, and openly celebrated. 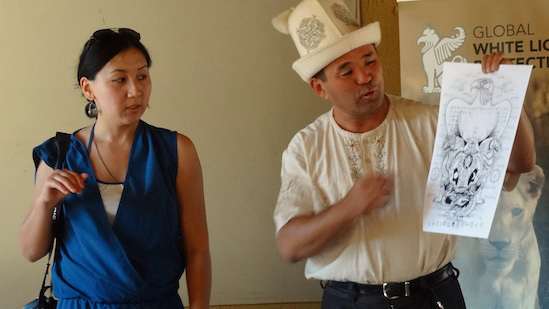 Recently Kyrgyz elders have been attempting to revive these spiritual connections. The Global Alliance was established in part as a support system for ICPs across the globe for whom a species of big cat has similar cultural importance. In the Kyrgyz language the spirit of the lion (and all wild cats) is called Sher. Humans also aspire to have this quality, to be lion hearted. Mayramkul had painted these animals often, but after seeing the sacred white lions on our morning game drive, he told us it was as if sher came alive for him, and will affect the paintings he will make in future.